Everyone of us deserve better. We wake up daily with a hope that the day ends well and strive to achieve for the betterment of our lives. As any parent, I also strive to see that my kid deserves the better, if not the best of the facilities and primarily, education. With education being the primary and most important concern for any parent, it is necessary that education reaches the kids. Most of us are financially well off and can provide quality education to our kids, but spare a thought for those who are not so financially well off. Imagine a situation where, due to lack of funds, you couldn’t get your child to provide for a Masters degree. How regretful you will be for your entire life! Robbing your child of education is truly a crime which no parent wants to commit. Moreover, what if the school that your child is learning suddenly stops functioning due to lack of funds? Wouldn’t you be crest-fallen? 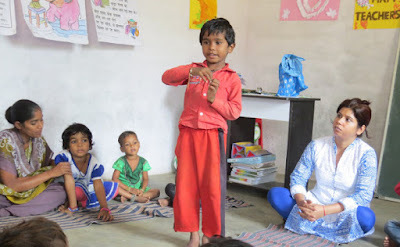 Same is going to happen with a rural preschool run by Aham Bhumika (Aham Bhumika is a registered NGO under Societies Act) unless some generous soul offers to donate some amount and see the children learn and educate themselves. The rural preschool is located in the village named ‘Borda’, 17 kms from Bhopal. They have 40 kdis belonging to underprivileged category whose parents work as daily wage labourers on brick kilns and construction sites. At present, the school needs 14,000 every month to keep functioning and imparting education to these kids. You can drop a mail at [email protected] with your name, address, donation amount, PAN no. and contact details. The full details on how to donate are given here. You can also buy hand-painted shoes from their website as well as hand embroidered, tribal motif , Gond Art cushion covers by pre-order. By buying a pair of shoes you will fund the education of a rural child for a period of one month. The price of shoes ranges from Rs.999 to 1499. This is an earnest request to fellow bloggers to help in spreading the word by blogging about it or by sharing the post. You can share using the hashtag FundAhamBhumika. If you choose to blog, then you can use images from their Facebook or Twitter profile. Think about it. A 1000 or 2000 rupees won’t affect us much, but it would work wonders for them. Moreover, we spend even more on movies and meals. So please don’t let the education of these children to suffer. Contribute as much as you can as each and every kid deserve better when it comes to education.